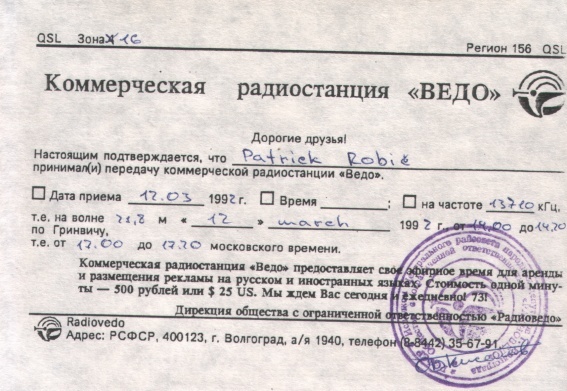 With the collapse of the Soviet Union in 1991, groups within the new Russian “Commonwealth of Independent States” seized the opportunity to have a global voice: enter shortwave. Few in the DX world could have predicted the boom in independent shortwave broadcasting and it made good sport for DXers, as most were using relatively low-powered transmitters, some using former Cold War jammer transmitters. 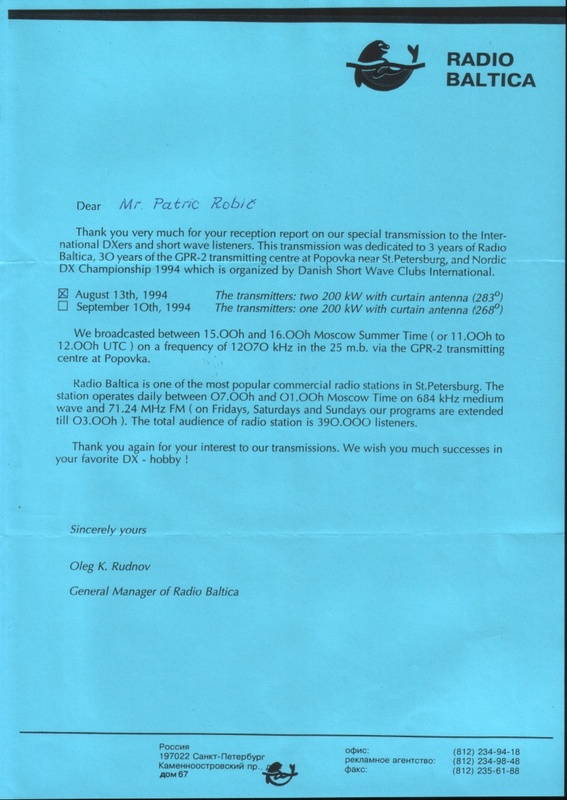 Using the DX Times as a reference source, the first mention of the newly deregulated Russian broadcasting scene appeared in the October 1991 magazine with a reference to radio station Ekho Moskvy (“Echo of Moscow”). 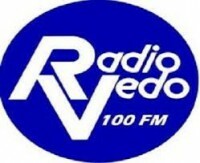 In the same issue Radio Vedo in Volgograd was reported signing on. 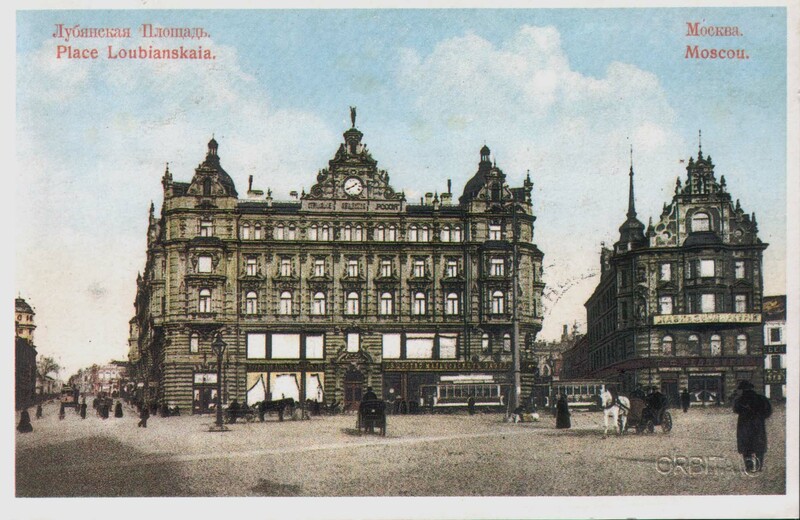 Soon after, another broadcaster appeared, with Radio Ala in St. Petersburg (formerly Leningrad) playing traditional “bard music”, therm given to singer-songwriters. 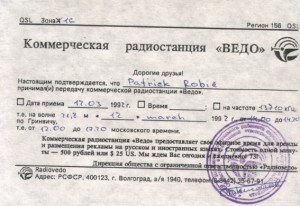 The right-wing Russian nationalist station, Radio Pamyat appeared in print early 1992, one of their programs was called “Fatherland, Memory & You”. 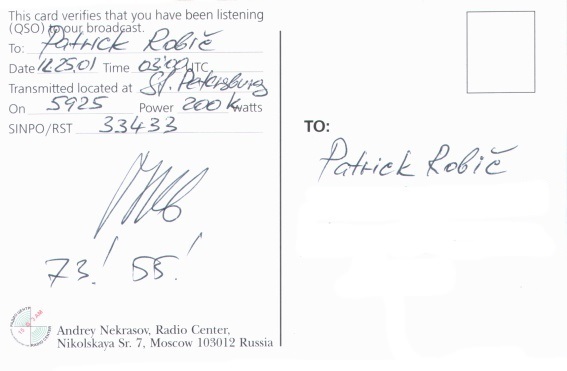 (Feedback from Patrick Robic: According to their QSL they were using a 200kW transmitter near Yekaterinburg too). 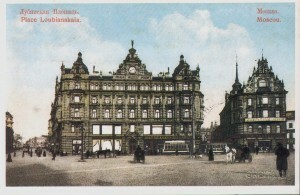 Around the same time Radio Rezonans, a station aiming at the new Russian business market signed on. Broadcasting from Ostankino, they carried ads in several languages. 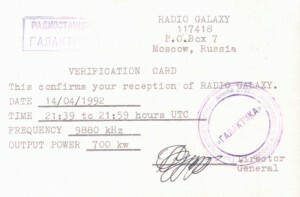 On February 23 1992, Radio Galaxy signed on from Moscow. This new commercial station even carried 3 hours a day in English and in May were palying Russian music and all announcements were in English. In the April DXT, a list compiled by John Fisher of DX Ontario was reprinted with many more broadcasters taking to air. 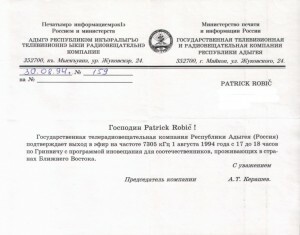 They include Radio Studia Dvizhenie (“Traffic Radio”), Radio Samara in Togliatti, Radio Tartar in Kazan, Radio Kudymkar in Yekaterinburg, Marly Radio in Yoshkar Ala, Radio Polis in St. Petersburg, Radio Perm in Yekaterinburg Radio Dalny Vostok, Radiostansiya Novaya Volna (“New Wave”) in Novisibirsk, Adygey Radio in Maykop and Kabardino-Balkar Radio in Nalchik. In the May DXT, Radio Space gets its first mention, the station’s name was given in English as were some of the program titles. In the same month Radio Polyus entered the fray. The following month they were joined by Radio Trek from Yekaterinburg and Radio Art. 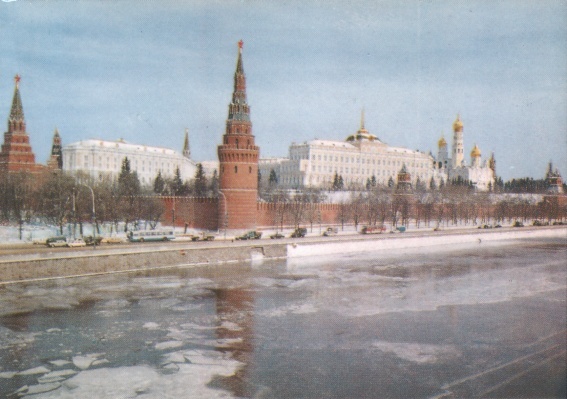 June saw first reports of Russian orthodox sender Radio Stansiya Radonezh and Radio Alef, (“alef” is the Hebrew pronunciation of the letter “A”) with announcements in Russian and Hebrew. 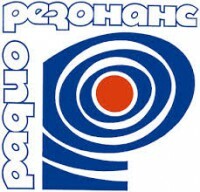 Radio Yunost a youth-oriented station had been on-air since 1962 before adding SW transmitters in Murmansk and Samara. Another new SW broadcaster as was Radio SNC with rock, pop and punk music, taking its name from the Stas Nanin Center, (Stas Nanin was a famous Russian rock promoter). Radio Without Borders International came to air with reportedly just 100W and may have been unlicenced. Radio Shark (in Turkic,“Radio East”) in Ufa, Bashkortostan first appeared around the same time. The following months saw Radio Yakutsk in the DX press and the launch of one of the best-known stations, Radio Nadezhda (Radio Hope) whose target audience were women, including programs on family issues. 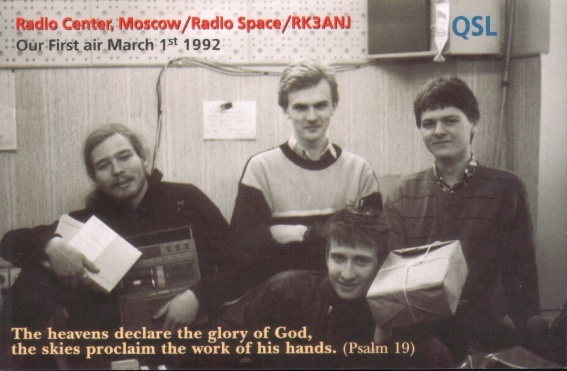 Radio Alpha & Omega also commenced broadcasting around this time, one of the few Christian religious stations from Russia. 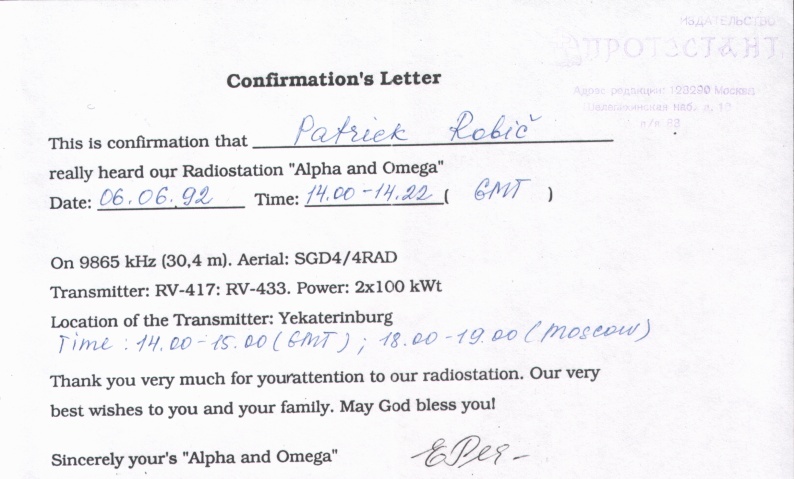 (Feedback from Patrick Robic: Radio Alpha & Omega must have been on-air at least from June 92. 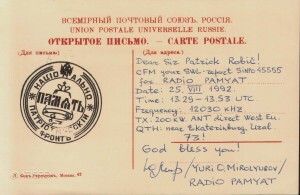 My QSL is from 6/6/92. 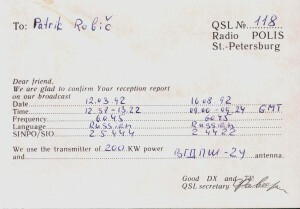 According to this using transmitter RV-417 and RV-433 (2×100 kW) and aerial SGD4/4RAD from Yekatrinburg). In September, Radio Bereyzovo using a former jammer tramnsitter from Kahnty-Mansyisk was first reported, along with Islamist voice Rukhi Miras (Tatar for “spiritual healing”) and Radio Chita. 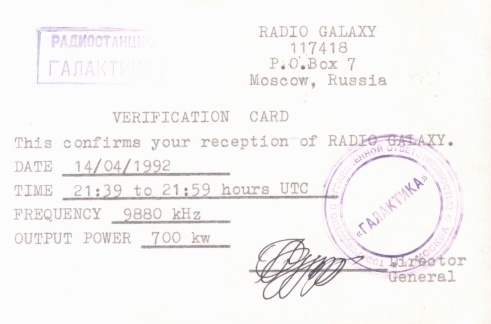 Others noted were Radio Maykop in Agydey language and Radio 101. 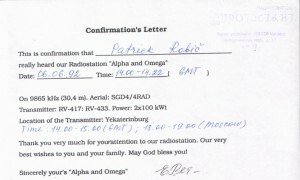 Next month, Radio M and Radio N appeared from Yekaterinberg sharing the same transmitter. 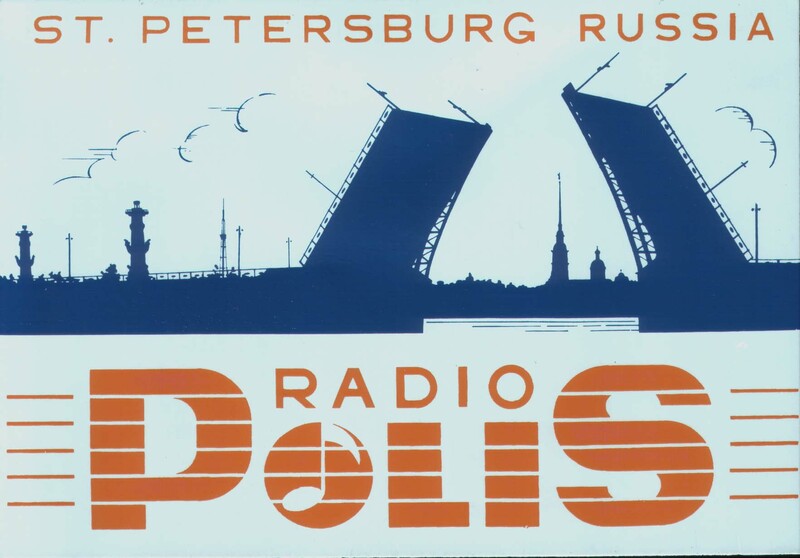 November saw Radio 7 using an ex-jammer transmitter from Samara along with a real mouthful for non-Russian speakers Radiostansiya Russkogo Patriotcheskogo Dvizheniya (“Radio Station of the Russian Patriotic Movement”), also known as Radio Blagovest, from the city of Irkutsk. They were joined by Radio Unis in Moscow and Russkoye Khristianskoye Radio (“Russian Christian Radio”). Soon after Radiostansiya Omega came to air also with15kW from a presuem ex-jammer. In early 1993 Radio Diapazon made its SW debut as did Radio Centr, hiring transmitter-time from Radio Moscow made their SW debuts. (Feedback from Patrick Robic: Radio Centr started on March 1st, 1992). 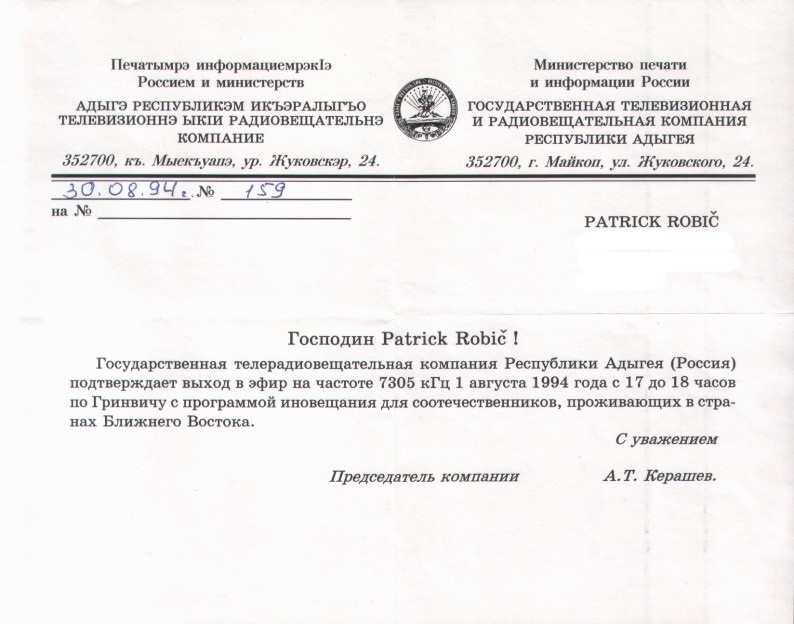 Then in May 1993, it was reported that Radio Art and Radio Ala had ceased broadcasting, presaging then end of a hectic 18 months in the new history of broadcasting in Russia. Whilst some failed, some grew stronger. 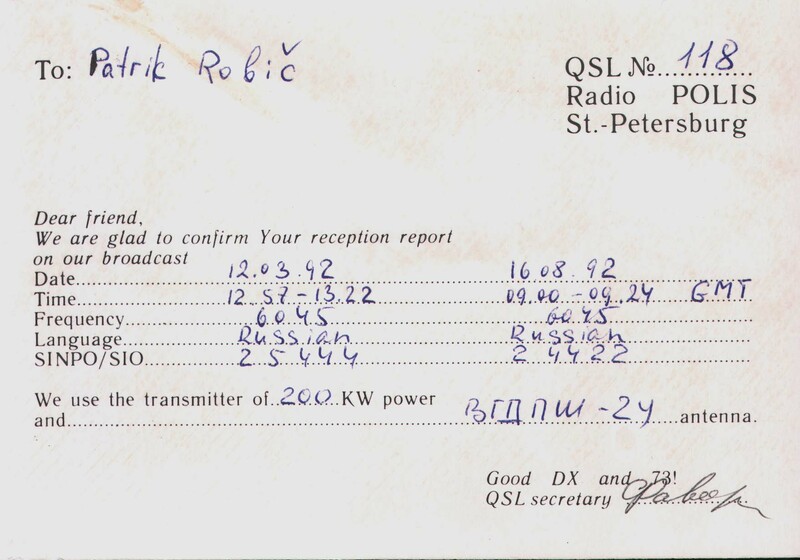 Radio Nadezhda had added more broadcast hours from more sites and Radio Galaxy commenced a DX program, hired time on a 250kW transmitter and started international broadcasts to Western Europe. During the year more new stations came on, Radio Mika M-4, Radio Titan Kompani (part-relay Radio Shark) with another re-purposed 15kW sender and Radio Raketa at Grozny on the shores of the Caspian Sea. 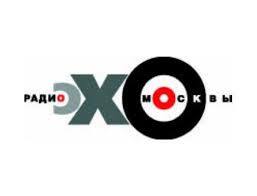 In September U Radio from Moscow was irregularly heard. More new stations followed, like Radio Ves Irkutsk and Radiochannel Uralskiy Commercheskiy Vestnik (“Ural Commercial Herald”) along with Radio Mir (“Radio Peace”). 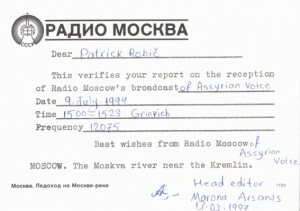 In 1994, Islamic station Radio Al-Risalah commenced from Moscow, hiring airtime from Radio Moscow and the Bolshakovo, Kaliningrad station. Radiostantsiya Lena described as a music and informational station, signed-on from Yakutsk. 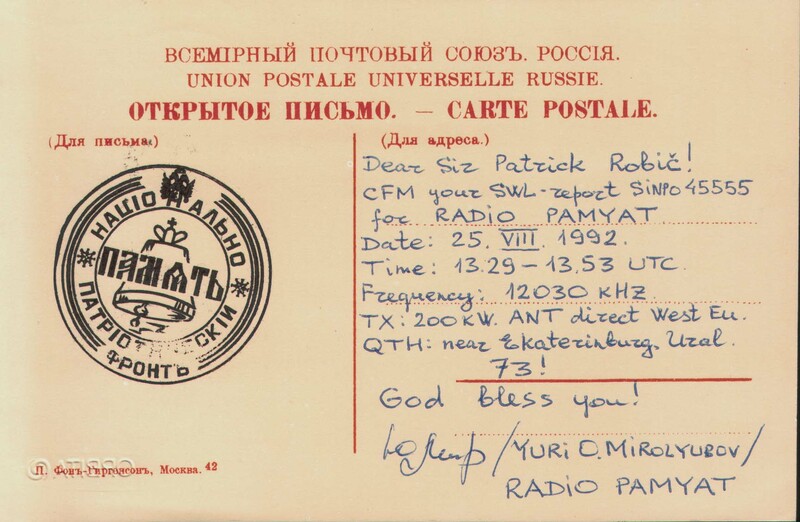 Late in the year, Radio Samorodinka in the Moscow region, announcing itself as a “private non-commercial program of authorised radio broadcasting” arrived on SW. Around this time, Radio Moscow renamed itself as the Voice of Russia. 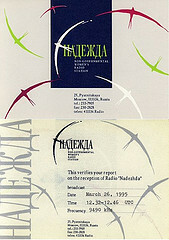 In June 1995, it was reported that Radio Nadezhda stopped broadcasting on shortwave and only broadcasting around the local Moscow area. Nadezhda had become the largest-scale independent broadcaster of the era. 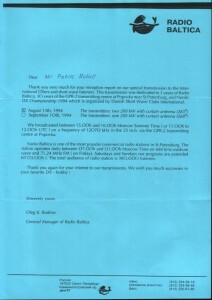 Then in May 1996, it was reported that they’d returned to SW on a single frequency. 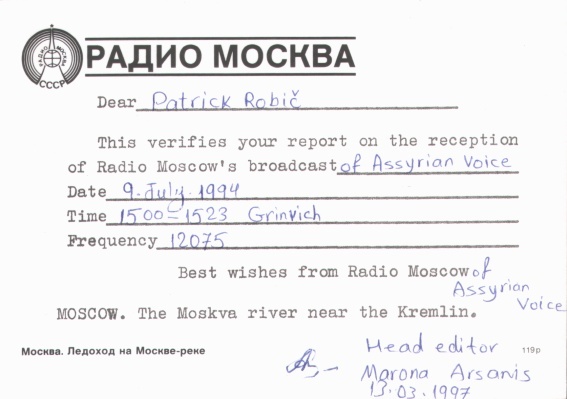 Another station with Islamic programming was reported in September 1996, Islamskaya Volna (“Islamic Wave”) from the Moscow Islamic Centre carried broadcats in Russian, Arabic and Tatar and directed some broadcasts to the Middle East. There were no further reports on any independent broadcasters for the rest of the year. Most of the above stations only lasted a short time. Some closed altogether, some moved to FM, some to the internet and a few are still on the air. So ended another interesting chapter in the world of DXing. Reader contributions, corrections, images and additional information on these stations is very appreciated. In particular, what groups or interests these stations represented and what happened to them. Please use the Comments box below.